"Leakey's Last Picture Show "
In the south west region of the Texas Hill country stretches the Frio Canyon. The Frio Canyon is one of the most delightful get aways for the many city restricted folks that vacation here year round. Situated along side the beautiful Frio River, is the small town of Leakey, Texas. It was the quiet flowing Frio River that drew the town's founder, John Leakey, to this area in 1856. You first notice that most of the business in this area carry a name that refers to the canyon, the river or the town and this is just not because "Googling" Frio or Leakey will get them many hits, it is a tradition that dates back to the early 1900's. This is the story of one of those first businesses. These traveling tent shows were a welcome form of entertainment in the small towns and rural communities everywhere. Many tent shows amused the audiences with circus acts, vaudeville, and silent moving pictures. A huge tent would be erected and pretty soon the crowds would come. The tents were generally cool and equipped with some sort of stage. The audience sat on wooden elevated bleachers known as the "buzzard roost." These shows even had gimmicks to draw in the crowds. Lanelle Auld, a life long resident of Leakey, remembered that one show would present a prize to the person who sold the most candy. While Libby Suttle, another who was born and raised in Leakey, remembered buying boxes of cookies looking for the gold ring that was within one of the boxes. Medicine Shows were another form of entertainment at the time. Many of these came to the Frio Canyon bringing various entertainment acts plus the opportunity to purchase elixirs that would cure all that ailed you. Hadacol was one of the elixirs that promised this amazing cure all. I can remember my grandmother speaking the word, "Hadicol". I knew that this was some sort of medicine and I wanted nothing to do with it so I avoided asking any questions. Certain things were just better if avoided. 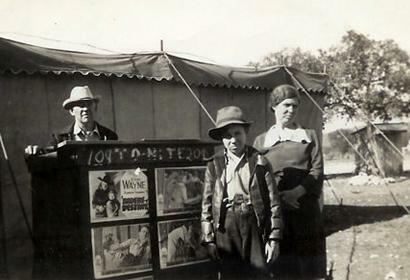 The Schultz Family Traveling Tent Show came to Leakey in the late 1920's. They would erect their tent between Lewis Casey's Drugstore and Lon Brice's grocery store. This location would be west of the present day courthouse. Lon Brice's store is still in existence though greatly remolded. It is still operated as a grocery store known as Hometown Market. Hometown Market is owned and operated by Clay and Elizabeth Pannell both descendents of early settlers to the canyon. The drugstore is still in existence though located in a different space on the same block. It has recently been reopened by the Snodgrass family. The Schultz's had their own power plant that ran the projectors and lights. When sound movies came along in the 30's it was necessary to have 110volt electricity. 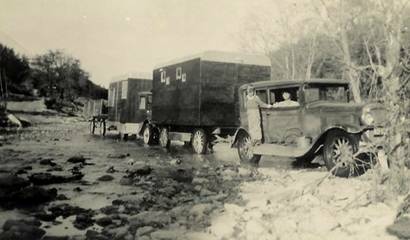 Lloyd Shultz, the youngest son of Jacob Lee Shultz and Mamie T. Johnson Shultz, wrote in Wagons Ho-the History of Real County: "The Booth Trailer held the projectors. There were four windows. Two were about six inches square for the projectors and two were about fourteen inches square for the operator to see through. Film for one movie was wound on five or six reels of one thousand feet each. The operator could change from one reel to the next by watching for "cue marks" in the upper right corner of the screen. The change over could be made without the audience being aware of the change. "These projectors stood about seven feet tall and five feet long. In the beginning, the film was made of material that was highly flammable. If the projector stopped for just a moment, the film would burst into flame from the heat of the lights. An alert projectionist had to be fast to grab the burning reel and get it outside to extinguish the fire. Until a more flame retardant film was developed in the 1950's most theater fires were caused by fires in the booth." 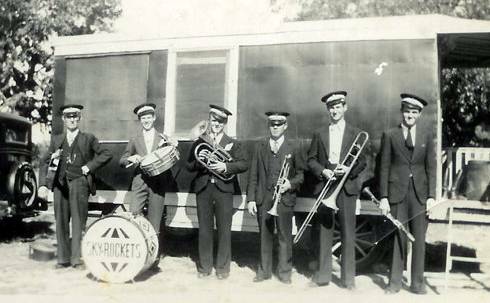 At the beginning of World War II, the Schultz family decided to set up a theater in Leakey for the duration of the war. They purchased two vacant lots from John Ricks for their project. A building of clay and tile was constructed and would house what would be known as the Canyon Theatre. This theater offered benches for seating and had a real screen and stage. The floor was made of tile and slanted to make viewing the stage area great for everyone. The new, modern, slanted floor eliminated the need for the "buzzard roost." Canyon Theatre was purchased in 1946 by Talbert and Joe Chisum. 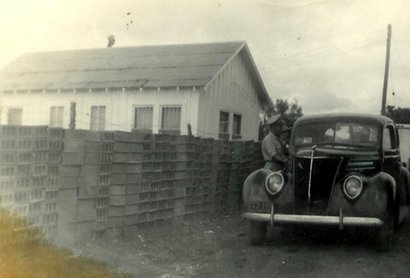 A few years later Talbert (Tollie) and his wife Annie bought out Joe's share of the business. 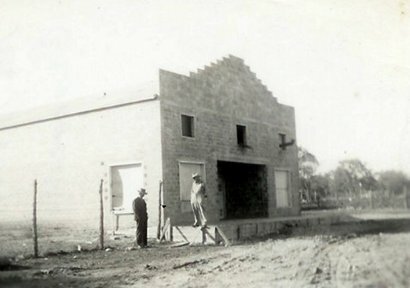 They eventually built a house behind the theater with a connecting door from the house to the theater. The home later burned forcing Tollie and Annie to move to Huntsville, Texas to be closer to the son Henry. Not only were motion pictures shown in the Canyon Theatre but several top entertainers of the day would come here to perform stage shows. Some of these early entertainers were Red River Dave and Maw and Pa Kettle. Red River Dave was known as a yodeling balladeer from San Antonio, Texas. He gained fame with his ballads about current events and is best remembered for "Amelia Earhart's Last Flight." Ma and Paw, on the other hand, were a bumbling country couple who managed to get into every kind of storm that you can think of! Granny and Jed Clampit had nothing on these two. There were also, around the time of Halloween, horror shows. These stage presentations would scare the heck out of us kids with magic acts and scary spooks but we loved it. The Canyon Theatre was just about the only entertainment for the children of the area. In the 60's these kids could go to the movies for a mere twenty six cents and with that twenty six cents you were able to purchase your ticket plus a coke and popcorn. What a deal! The Canyon Theatre was the social spot of Leakey. Most of the kids of the canyon didn't have vehicles so parents would drop them off and pick them up at the end of the show. Some would even just walk home. There was nothing to fear in those days. Everyone had their seating more or less reserved. The younger kids could not get close enough so the front rows, those closest to the screen, were where they raced. The teens would sit on the left side in the back rows while the adults were in the middle section, mid way down. No one sat in the balcony. Tollie's sign, "No One Allowed" put enough fear in everyone that you didn't dare go up the stairs. It seems that the reels were always breaking the film and the audiences would chant, "Tollie, Tollie" until Tollie got the film patched and the movie started right where it left off. Chanting the word "Tollie" just seemed to be a magic word to everyone in the theater. But progress soon came to the canyon. Those huge saucers went up bringing long awaited television reception to the Frio Canyon. Prior to the satellite dishes, a very snowy picture was the best that those television boxes could offer. A clear television picture offered the people an opportunity to stay at home. Audiences at the Canyon Theater grew smaller and smaller. Television reception kept improving and then the DVD player was introduced to the world allowing everyone to enjoy movies at home. It was on one misty night that the reels did not turn. Tollie and Annie prepared for the crowd. Tollie threaded the projector while Annie got ice for the coke machine and popped the corn. At 7:30 they opened the doors for the patrons. Annie counted her change in the ticket booth. It was shortly after 8:00 that Annie and Tollie realized that no one was coming. For a moment they stood on the front porch of the theater. Realizing that it was the end of an era, they walked back inside the theater and closed the doors, forever.